I am a self-professed beauty junkie. I love to try new products all the time. I am also frugal and hate spending money at the salon! I thread my own eyebrows and upper lip, which saves me $10+ every two weeks. I color my own hair, which saves me $70+. I also cut my own hair. Now I know that sounds scary! But with the Creation Magic Hair Cutting Clip, it’s really not! I love this clip because it has a built in level that allows you to make sure you are getting an even cut. No lopsided bobs or uneven layers! You can give yourself a haircut or give one to your kids. And you don’t have to worry about cutting too much, because you can practice with just the ends. The clip allows you to cut a little at a time! 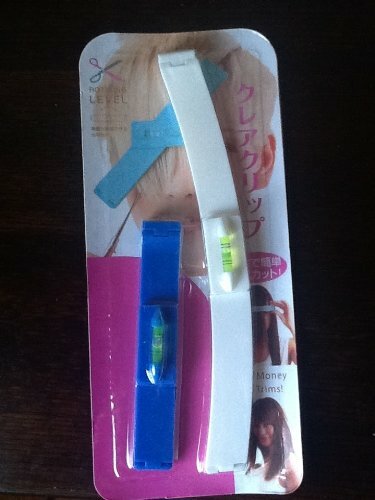 The smaller clip is for bangs! My daughter and I have long and wavy hair, and this allows us to get great looking haircuts for a fraction of the cost of a salon trip! Check out YouTube for tutorials on how to use and how to cut different styles! Get yourself a pair of quality barber scissors as well! This is a personal review. I did not receive compensation for this review. This post may contain affiliate links. Previous PostCrazy Couponing Money Challenge — Day 4Next PostAmazon Deals Less than $3 Shipped!